The 2018 Crosman All-American Field Target Championship (CAAFTC) has come to a successful close. Hosted by the Rochester Brooks Gun Club on July 20-22, there were over 90 competitors from seventeen states, two Canadian Provinces and Puerto Rico. Jeff Paddock from Olmsted Township OH was the All-Around Champion, knocking down 145 out of 180 targets. 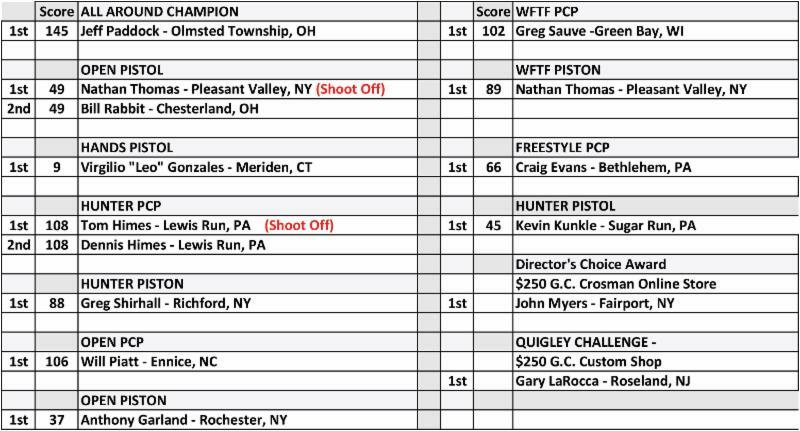 Other notable results included Greg Sauve of Green Bay, WI, edging out local competitor Peter Brooks of Rochester, NY to win the WFTF PCP division by just one target with a score of 102 to 101. In the Hunter PCP Division, Tom Himes ultimately triumphed in a shoot off against his brother Dennis Himes after ending the first round in a tie. See a complete listing of all results below. The Championship, now in its ninth year, welcomed shooters from The CAAFTC is sanctioned by the American Airgun Field Target Association and is a featured AAFTA Grand Prix event.